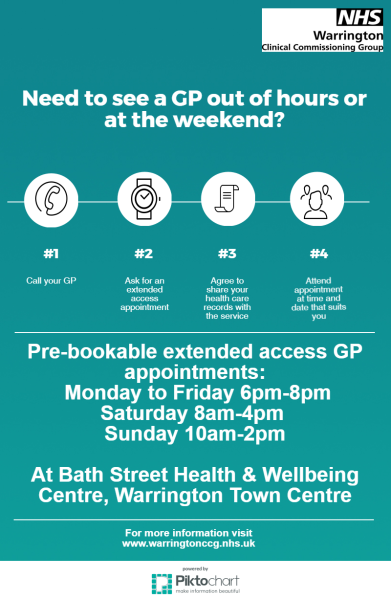 Our patient also have access to evening and weekend appointments with a local GP at the 'Extended Access Service', where pre-appointments are available from 6pm-8pm Monday-Friday, 8am-4pm Saturdays and Sundays 10-2pm at Bath Street Health and Wellbeing Centre. Easily accessible, the Health and Wellbeing Centre is in the town centre and has links to public transport on the town’s main bus routes. Having Extended Access appointments available in the evenings and at the weekend offer people the opportunity to access a wider range of pre-bookable appointment times to fit with work and family commitments. PLEASE NOTE: You will not see your usual GP at an Extended Access appointment. To access an Extended Access Service appointment or to sign up for GP online access please call the practice on 01925 843883 during our normal opening hours (telephone lines are open 8:30am - 6:30pm Monday to Friday) and speak to a member of our reception team who will arrange the appointment for you. Please be aware that you will need to consent to share your medical record with the Extended Access GP. Where are Extended Access appointments held? If you fall unwell outside of our opening hours and need to see a GP, please call the NHS111 service by dialling 111 from your phone. NHS111 can give you advice over the telephone, or can arrange an appointment with the local Out of Hours GP if this is required.